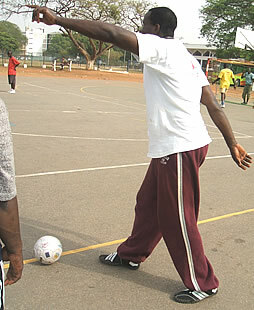 Sports has been an area of interest to blind persons the world over and Ghana is no exception. The Ghana Bllind Union , (GBU), has made great strides in ensuring that sporting activities are brought to the doorsteps of Blind and Partially Sighted persons thrugh out the Country. In line with its policy of forging partnership with other international Organisations, GBU has developed strong links with the South African NGO League of Friends of the Blind (LOFOB). As a direct benefit of this relationship,LOFOB through its Wellness and Recreational Programme, facilitated a sports clinic for GBU. This clinic drew participants from five out of the ten regions of Ghana including members of GBU’s own sports committee. 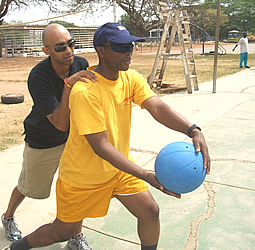 During the four-day clinic the sportsmen and women were taken through a series of activities which included games such as; track and field athletics, soccer and goal ball. The sports fieldsl of Legon were turned into a hub of activity with blind sportsmen and women jumping, running, diving and rolling to meet the excigencies of their various disciplines. For the period of the clinic, the air was filled with the melody of the clanging of various sizes of Bell balls. These are special balls which have small pieces of metal in them, omit a jingling sound which allow the blind person to follow movement and thus identify their location. Sports for blind personz has proven to be a realy exciting area. This was especially so for those perons who for the first time express and release their inner energy which had so fasr remained un tapped. Even the massaging of tired muscles turned out to be an exciting activity and was done amist jokes and laughter from the participants. But all was not just games. The last day was spent on discussing how the participants would continue and how to bring the things they had learnt during the sports clinic to the regions. The participants all committed themselves to this task. Following stronglhy on the heels of this event, the sports Wing of GBU was born. This opened up a new chapter in the life of GBU. Branches have been formed in every Region. Subsequently, there is a growing interest in sporting activities among BPS persons all over the Country. For the first time,. Sporting activities were included in the programmes of some Regional Conventions. Sports is an avenue which if properly harnessed, will enhance the social inclusion of BPS persons in the Country. Thus by entrenching sports as a main sphere of GBU activity, blind and partially sighted persons in Ghana will not be left out on all the good aspects of participating in sports like better health, social inclusion and the building of self esteem.